White, double, fragrant, late, 32" tall, lactiflora. 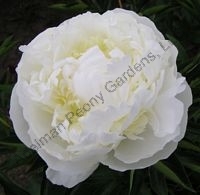 Pure white dome-shaped, very fragrant flower with strong stems. Stands up well in wet weather. APS Gold Medal winner 2011. 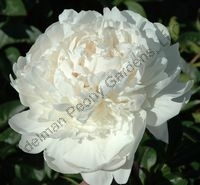 White, full double, very fragrant, late, 32" tall, lactiflora. Large, lovely, full double flowers need support. You'll love the rose fragrance! White, single, very early, 30" tall, quadruple hybrid. This white flower glows with raspberry flares surrounding yellow stamens. One of the earliest to bloom. Very unusual and fit for royalty! White, double, lightly fragrant, midseason, 35" tall, lactiflora. A full flower with red flecks on petal edges. Good petal substance. Stands up nicely. 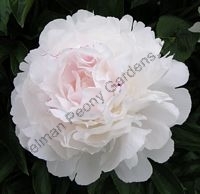 Creamy white, double, lightly fragrant, midseason, 34" tall, lactiflora. 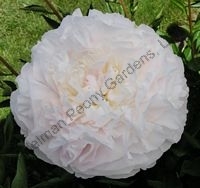 Very large, luscious cream-white flower. Wonderful cut flower! APS Gold Medal Award 1981. White, bomb, fragrant, midseason, 34" tall, lactiflora. 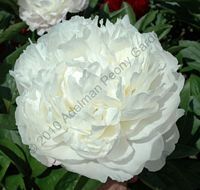 An elegant ivory-white bloom with graceful form. White, japanese, midseason, 34" tall, lactiflora. An all white flower with abundant thin petaloids filling the center. Will stand up nicely in spring rain. White with red stripes, double, lightly fragrant, mid to late season, 32" tall, lactiflora. Amazing bi-color with unusual dark pink/red striping, may need support. White, bomb, midseason, 32" tall, lactiflora. A graceful bloom emitting a yellow glow from the base of the multitude of petals. Cream, single, very early, 36" tall, hybrid. 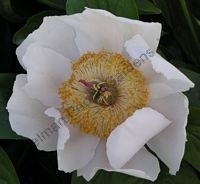 Long silky golden stamens in the center of large, creamy white petals. This lactiflora x macrophylla cross has very large glossy dark green leaves. 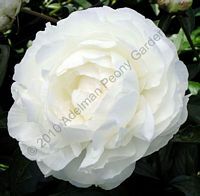 White, crown-type double, lightly fragrant, early, 36" tall, lactiflora. Large outer petals surround white bomb with a glow of yellow from inside. Tall for the back of the border. 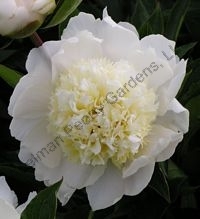 White, double, midseason, fragrant, 36" tall, lactiflora. 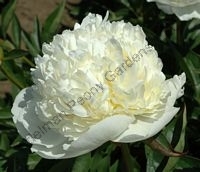 A creamy white full, fragrant bloom with pleasingly cupped petals. 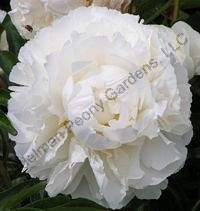 Creamy-white, double, very fragrant, midseason, 34" tall, lactiflora. 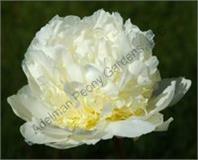 Globe-shaped, creamy-white flower with green carpels and a yellow center glow. A much loved old favorite! White, double, very fragrant, late, 28" tall, lactiflora. Large, perfectly formed rose-type flowers with a texture like velvet. Worth waiting for in the late bloom season! APS Gold Medal Award 1943. White, semi-double to double, midseason, 28" tall, lactiflora. May have red streaking on outer petals at times. White, double, very fragrant, early, 36" tall, lactiflora. 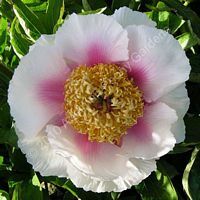 A massive, romantic, pure white flower lightly flecked with crimson. Blush-white, double, fragrant, midseason, 34" tall, lactiflora. Golden stamens mixed with center petals on a very beautiful gardenia shaped flower. Glows creamy yellow. 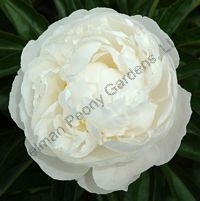 White, double, lightly fragrant, midseason, 34" tall, lactiflora cultivar. 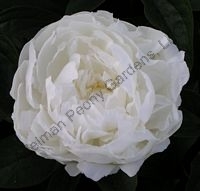 A magnificent large, pure white double. Strong stems and dark foliage. 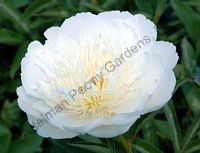 Pure white, single, midseason, 34" tall, lactiflora. Large, white, crepe-paper textured petals with a tuft of golden yellow stamens in center. Stands up in rain. Award of Landscape Merit 2009. 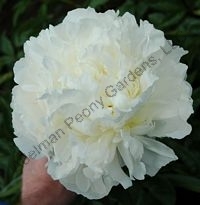 Milky white, bomb-type double, fragrant, midseason, 32" tall, lactiflora. A wonderful landscape plant that holds its flowers upright. Compact bloom good for floral arrangements. Off-white, double, fragrant, late midseason, 32" tall, lactiflora. Very large flower with a flat face. 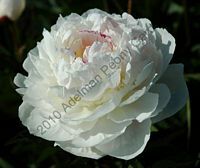 On opening it is tinged with a delicate flesh pink center that fades to off white.